"We are in this for the long haul. Are you with us?" We’ve learned the hard way that many environmental struggles last a very long time. 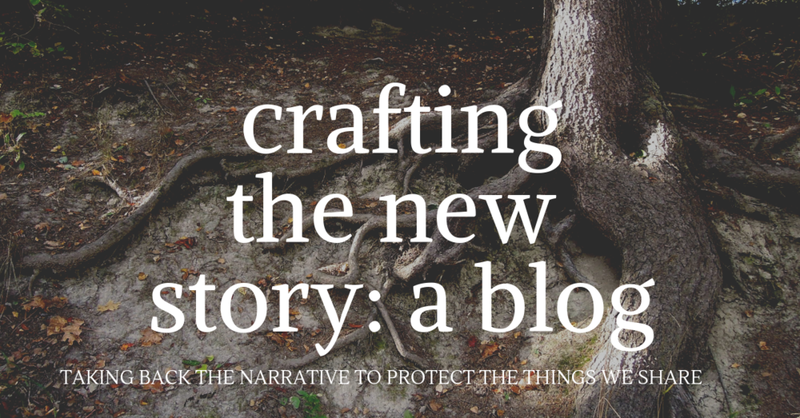 After the cameras have turned to other media stories and new issues arise, environmentalists are left suing, petitioning, carrying out direct actions, and monitoring damage. So many public health and environmental issues are long-term problems- we have to play the long-game. A case in point: pipelines. Pipelines carry fossil fuels and threaten drinking water and, obviously, increase the likelihood of climate chaos. We try to block the pipeline from receiving permits and being granted eminent domain. But, under this current political regime, most pipelines are being approved. That means we have to monitor construction for violations of the law, bring legal challenges and be vigilant for leaks and spills. We have to have emergency response plans and make sure post-construction permit terms (like insurance) are in place. We at SEHN are committed to helping coalitions and groups with these long, on-going struggles by sharing with them our scientific and technical support. I wanted to take this opportunity to tell you of a couple of on-going efforts to protect water, soil, climate and future generations. While they are no longer in the public eye, they are demanding fortitude and skill from activists—these are the places we bring SEHN’s particular expertise to bear. The well-known pipeline, Dakota Access is one of those long-term, thorny issues. Our long-awaited day in court finally happened September 12th, 2018 when the Iowa Supreme Court heard the environmentalists and landowners’ challenge to the state permit given to Dakota Access for its crude oil pipeline. You may remember the large Indigenous resistance of water protectors at Standing Rock in 2016 that tried to block Dakota Access (DAPL) from crossing the Missouri River just north of the Standing Rock Sioux tribe’s reservation. You wouldn’t be alone if you thought Dakota Access was a done deal since it is up and running with crude oil flowing through it. In fact, the lawyers for DAPL made that exact argument in the Supreme Court and essentially said the Court should throw out the case. However, in rebuke, a justice replied that if they did declare the case moot, just because the pipeline was already established, we would never have justice for illegal acts. Communities fighting against these pipelines are actively demonstrating that they do not consent to these projects. Without the free, prior, and informed consent of the governed, democracy fails. Community consent is an emerging right identified in the U.N. Declaration on the Rights of Indigenous Peoples which recognizes the right of Indigenous communities to give or withhold consent to proposed projects that may affect their land and future. 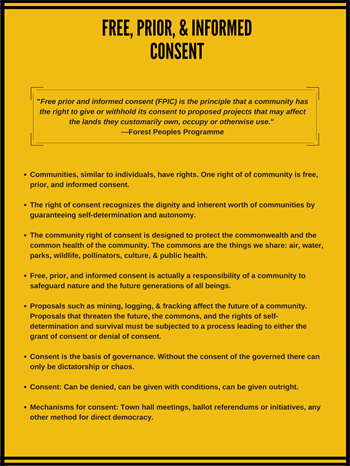 For more information on Free, Prior, and Informed Consent and its place in democracy and the environmental movement, we have provided further reading (a re-visit of our work on democracy and consent) and a downloadable/printable fact sheet below! Get your own copy HERE. 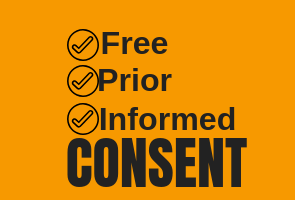 There are some interesting corollaries of the community right to free prior and informed consent. The first is that communities have rights, not just individuals. Community rights fit with the expanding ideas of the commons and the law of sharing. Another corollary is that community rights, especially free prior and informed consent, invite political imagination so that we can create institutions and processes to carry out the rights of community. We can create legal guardians for future generations and institute things like community benefits agreements. Ultimately, at a minimum, communities should have the right to say no and yes–a true right like free speech.